Although most people don’t like to think about it, death is inevitable. It’s imperative that you have an estate plan in place that outlines your end of life wishes and how you would like your assets distributed upon your passing. As part of your planning, it’s important that you consider and make arrangements for your funeral. By planning this event before your passing, you can spare your family difficult decisions and ensure that your send off is exactly as you’d like it. Funerals are not limited to churches or temples. If you’re not religious or if you want something different, you might ask that your relatives instead hold a memorial service in your honor at the park or even at the family vacation home. Perhaps you hate the idea of being buried at the local cemetery and would prefer to be cremated. There are many options and having your relatives all agree upon one can be challenging. Be sure to make these wishes known as part of your funeral planning. You wouldn’t want someone picking the song for the first dance at your wedding so why would you want someone else deciding all of the details of an event to celebrate your life? As part of your funeral planning, list songs you might want played or poems which should be recited. If your favorite vacation was to Hawaii, you might want to brighten up the event with tropical flowers from Maui. It can be difficult to write about your life but for many writing their own obituary can help them reflect on the important things while giving them a chance to highlight their proudest moments. If you aren’t a writer or find this task daunting, consider writing a few bullet points for your loved ones so the information they share is accurate and provide a list of publications where it should be featured. Sure, your children may know that you belong to the church book group but they may have no idea that that same group has a newsletter which should share this information with fellow members. Traditionally when a person died, his or her children had the task of going through the old phone book and calling contacts to inform them of the news. Today, many of us connect with friends and relatives online. To help your heirs effectively communicate information about your passing, be sure to store your online passwords in a place where your relatives can find them and access the appropriate accounts accordingly. Funerals can be very expensive and a huge burden for many families dealing with the loss of a loved one. Luckily, with the right planning, you can prepay for your funeral and save your family the expense. Generally an attorney or a funeral director can help you to determine how much money will be needed and help you to establish a trust where it will be stored until your passing. 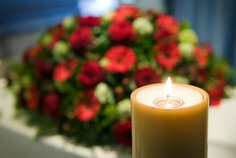 While planning your funeral may seem to be a depressing thought at first, it is actually empowering—allowing you determine how you will say farewell to your loved ones and leaving you with peace of mind knowing that you’ve taken care of every last detail so your family can celebrate your life without the added stress of planning your funeral.